The Yokaren (Japanese Naval Preparatory Flight Training Program) started in 1930, and the number of entrants to the Yokaren increased dramatically in the last two years of World War II. Numerous Yokaren-trained pilots and crewmembers carried out kamikaze attacks on Allied ships, and many more young men were still in training at the end of the war. About 80 percent of the graduates of the Yokaren died in battle . In 1940, the air base at Tsuchiura, located 55 km (34 miles) northeast of Tokyo, became the base used by the Yokaren, but the Navy added several other bases (e.g., Kagoshima, Mie, Matsuyama) later in the war as the number of trainees sharply increased. The Yokaren Museum was established in 1968 at the site of the former Tsuchiura Air Base, now the location of the Ordnance School of the Japan Ground Self-Defense Force (JGSDF) [2}. The Yokaren Museum's one large exhibition room has photos, letters, and other items of Yokaren-trained soldiers who died in battle. About twenty percent of the museum's displays relate to kamikaze pilots and other naval special attack corps members who carried out suicide attacks, such as the pilots of kaiten (manned torpedoes). Each photo includes the person's name, Yokaren training class, home prefecture, date and place of death, and an indication whether the person participated in a special attack suicide operation. The photos do not have the men's ages at death, and almost all appear to be in their late teens and twenties. The museum has over 300 photos of individuals, but there is no explanation as to why only these are displayed out of over 18 thousand Yokaren-trained men who died in war . The museum displays many original letters and other items donated by the families of dead soldiers. Visitors will not be able to read several letters, wartime newspaper articles, and other written items since they are too far from the glass in the vertical display cases. Some photos, especially of groups of soldiers, do not have identification labels. The display room has summaries of the history of the three principal Navy's suicide attack operations: kamikaze (by plane), kaiten (manned torpedo), and ohka (piloted bomb powered by rocket engines and launched from plane). Other items on display include photos of several special attack corps, a model ohka, model planes, uniforms, hachimaki (headbands), senninbari (thousand-stitch belts worn for good luck), textbooks used by Yokaren trainees, medals, and sundry items used by soldiers. The JGSDF Ordnance School, where the museum is located, has very tight security. After ten minutes of discussion among security personnel and their superiors, I was allowed to enter the base with a U.S. passport. Visitors must be escorted from the base entrance to the museum and are under constant surveillance at the museum as soldiers rotate guard duty there about every hour. Museum entrance is free. All exhibits are in Japanese, and the museum does not provide any information on the Internet. The museum provides a pamphlet with photos that gives the history of the Yokaren. No book on museum exhibits is available, but the store next to the museum has one book of letters of Yokaren soldiers and one book on the general history of Japan's special attack corps. 1. From inscription on Yokaren Monument in Ami Town, Ibaraki Prefecture. 2. 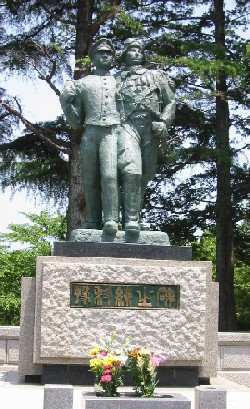 The address of the Ordnance School of the Japanese Ground Self-Defense Force, where the museum is located, is in Ami Town, which is next to Tsuchiura City. 3. Figure from display at Yokaren Museum.